The district of Testaccio is a kind of hidden gem of Rome. When visiting the eternal city, normally tourists explore closer to the city center and spend a lot of time at the generic tourist attractions like Trevi Fountain and the Spanish steps. After getting to know the city a little better, Testaccio is an extremely underrated district of Rome. Easy to get to via the Metro straight to the stop Piramide on the B line, the largely working-class neighborhood has sights of its own and a wealth of history and more modern attractions. Right outside the stop, you will almost immediately see the Pyramid of Cestius. A half-sized pyramid that’s a tomb to a religious figure. Right next to the pyramid is a portion of the Aurelian Walls that used to outline the borders of the city of ancient Rome. At this specific part of the wall, there was a battle between the Romans and German forces during World War II when the Germans tried to siege the city. Since this district has a large portion of its history rooted in the war efforts, there is a beautiful cemetery a short walk away from the pyramid where British and Irish troops who were allies of the Italian army were buried. It is beautifully maintained and enclosed, giving it a reverent stillness from the hustle and bustle of the street. In addition to the rich history of this neighborhood, it’s now a hotspot for the youth of Rome. Home to many extremely popular dance clubs and bars it’s the place to be when the sun sets. It’s also the home of the main campus of the University of Rome. The campus has taken residence in an old slaughterhouse complex where they remodeled the entire inside of the buildings and left the outside to still have the appearance of a meat processing plant. Another interesting aspect of this neighborhood is their giant hill of broken clay containers named Monte Testaccio. Roman pottery and containers used to transport food, water, and other supplies that have been discarded behind old factory buildings that date back to the Roman Empire. This led to the build-up of a giant mound or hill of these clay fragments that have now become overgrown with trees and plants and almost looks like a completely normal hill, but once you look a little closer you can see all of the broken clay contains that create this hill. It’s definitely a must see when in Rome. Throughout the semester, our class tours have taken us all over the beautiful city of Rome, which we have learned to call home. Within the past few months, we have seen our fair share of ruins, cafes, and tourist attractions. 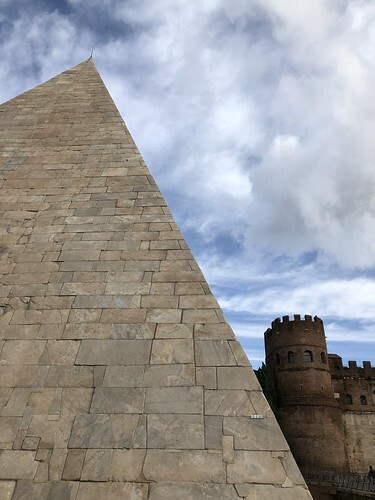 However, on Monday morning, we embarked on our final tour of the semester to see a monument that many typical tourists and study abroad students don’t get to see: The Pyramid of Cestius and the Rome War Cemetery. Although getting to this area of Rome is a bit of a hike, it’s definitely a must-see and worth the trip. To get to The Pyramid and cemetery, we rode the metro from Cipro to Termini Station, where we then transferred to the B Line and rode to Piramide. If you plan on visiting this site, try to plan it around rush hour, because the metro ride is lengthy. After exiting the metro station, I was immediately taken aback by how massive The Pyramid of Cestius is in real life. Unexpectedly, I felt like I was visiting the Colosseum for the first time. The structure is impressive, spanning 30 meters wide and approximately 40 meters tall. It was originally built as a tomb for Gaius Cestius, who by no surprise was an important figure in Roman history. Unlike the majority of monuments and attractions in Rome, this pyramid is in great condition, standing tall since 12 B.C. It is the only of its kind in Europe, and was sculpted out of concrete and white marble. While it is easy to see the presence of Egyptian art throughout Rome, like the Sphinx in Piazza Del Popolo, nothing quite measures up to the Pyramid of Cestius. After marveling at this massive structure, we made our way to the Rome War Cemetery down the street. The cemetery is small, yet it holds over 400 graves of Commonwealth soldiers. It is beautifully designed, and provides a lovely resting place for the honorable men that are buried there. Constructed in 1947 after WWII, it was commissioned by the Commonwealth War Graves Commission, which is an English organization that funds the construction of other cemeteries. In the War Cemetery, visitors can pay their respects in peace and quiet to the fallen soldiers who are laid to rest there. After countless tours walking through the busiest areas of Rome, our class tour of Testaccio served as the perfect way to end and reflect upon a semester full of growth and learning. Starting your day at 9 am with a trek up countless stairs isn’t exactly a picture-perfect morning, but once you’re at the top you may change your mind. Villa Borghese gardens, the third largest park in Rome, has views that will take the breath out of any onlooker. Before opening to the public in 1903, the park was once a vineyard owned by Pope Paul V. In 1605, he turned it over to his nephew Scipione Borghese, who built it into a beautiful villa. The park features an unbeatable view of Piazza del Popolo, monuments dating back hundreds of years, and beautiful landscapes. One of these being the Temple of Aesculapius. It is a small temple featuring the God of medicine, Aesculapius. It graciously stands at the edge of a beautiful pond. On a beautiful morning, we had, it seemed like a euphoria. Although it is not magnificent, the spot is somewhere I would return to. It’s the perfect place to read, enjoy lunch, or simply watch the ducks (which is quite entertaining). The Villa Borghesi gardens is a serene getaway from the busy city of Rome. It’s a perfect place for your inner tourist to take a quick snap of the view, then a brief walk down the road for your inner peace. Vietnamese Food in Rome? Pho Sho. Ah Rome, the city of carbs, espresso and complaining how stuffed you are after a huge Italian meal. If you’re ready for a change of pace, I found the perfect restaurant located in downtown Rome, minutes away from the Colosseum. Pho1 offers a plethora of Vietnamese dishes to choose from including spring rolls, nem ran, and different options of traditional pho dishes. The place is on the smaller side, but it has enough tables to choose if you want to sit outside or inside, and has a relaxed feeling on the inside. I chose the pho dish with beef, and it turned out amazing. Pho1 lets you either choose a small or a large size bowl, and the small filled me up for being rather hungry. The service was efficient, and my dish took no longer than 10 minutes to come to the table. I was definitely a happy camper. A hidden gem in Rome is the Vittorio Emanuele neighborhood, blocks away from Termini station. The Chinese form one of the biggest non-Italian ethnic groups in Rome, and a majority of them reside in this neighborhood. The Roman-Chinese community is active in creating an atmosphere adherent to traditional Chinese markets, shops, and eateries. The official name of the neighborhood is “Esquillino,” and it is becoming a more popular destination for local Italians to try some ethnic cuisine. A fan favorite is Esquillino’s Hangzhou Da Sonia (pictured below.) Their diverse and lengthy menu is skilled enough to satisfy any Chinese food craving that you’re itching for. Their dumplings offer the perfect light starter, and their renowned spicy chicken is enough to leave you daydreaming about it. The restaurant is located on Via Principe Eugenio, 82, and is open daily from 12pm-3pm, and 7pm-11:30pm. The atmosphere is more than welcoming, and it’s a great spot to catch up with your friends after your monthly weekend get away. Another raved about Chinese food place in the area is Old Chengdu. If you are a spicy person, then this spot is definitely going to be your new favorite. The authentic Sichuan menu allows for daring taste buds of all kinds, and they even have a discount voucher on yelp where you can receive 20% off your meal if you use the Chinese version of yelp. This spot is the perfect place is you are getting tired of Italian fare, or a great way to excite your taste buds. Whether you are getting bored of Italian food or looking for a new and exciting experience in the Eternal City, the Chinatown neighborhood will satisfy all your cravings. With the neighborhood conveniently located near Termini station, you and your friends should have no excuses to not check these awesome spots out. Every year Rome expands their food selections, and the up and coming Chinatown is a great way to explore alternative options to loads of carbs and Tiramisu. What are you waiting for? Mangiare! If you are looking to get to Rome’s Chinatown neighborhood, take the A line metro toward Termini Station, and get off at the Vittorio Emanuele exit, and voilà, you’ve arrived! Though not as popular as the barracks of Il Colosseo, Quartiere X Ostiense offers ample opportunities for interested travelers to immerse themselves in Rome’s vast war history. The neighbourhood holds the remains of Porta San Palo, a gate built into the Aurelian Walls in 275 AD. The gate served Rome as an important trade connection. In fact, a museum to honor its significance is held in the gate’s towers. In this area, the first Special Service Force fought the battle of Porta San Palo in September 1943. Plaques to commemorate the 570 casualties of that battle were places moments away from the gate. A short walk from the Piramide di Caio Cestio, an Egyptian-inspired tomb built for Gaius Cestius in 12 B.C., stands the Rome War Cemetery. It is one of the few war memorials in the Eternal City and occupies a sacred space among Italy’s history and involvement with WWII. Nearing the end of the Second World War, Italy was still occupied by German troops despite being declared an open city in early 1943. Italy’s government had even sued for peace before Allied soldiers came to their aid. The Allies pushed back German lines from Salerno all the way to Rome. Rome was completely liberated by Allied forces on June 4th, 1944. The cemetery was designed by Louis de Soissons. Among the buried are soldiers from Rome, the surrounding region and even prisoners of war. The soldiers come from several different sectors, including Canada, the UK and even South Africa. In total, there are 422 people buried in Rome’s War Cemetery. The cemetery is walled off, creating a peacefully isolated atmosphere for people to come and pay respects. The experience is truly thought-provoking and one I recommend to anyone interested in WWII history or war memorials in general. War memorials immortalize and honor those lost to the tragedy of battle. Even more, war memorials represent the connections formed amongst nations in times of hardship. I believe that one of the epitaphs in the cemetery say it best: This corner of a foreign field is forever England. To find out more information about the cemetery’s opening hours, other nearby memorials and even identified casualty records, visit Commonwealth War Graves Commission. Nous! Sommes! Résistant! Nous! Sommes! Résistant! Nous! Sommes! Résistant! It was a Saturday afternoon, and I had just spent an exhausting five hours inside of the Louvre. I was aware of the protests that had gone on the last weekend in Paris and a bit about the context, but I did not know, didn’t even think of the possibility that the yellow vests, or les gilets jaunes would take to the streets again for what would be the third weekend in a row of chaotic protests throughout the city of Paris. Once I had left the Louvre, I had journeyed over to the Christmas Market in Jardin des Tuileries. As I got closer to the entrance, I began to hear pops and bangs in the distance. I kept walking past the Market, and the sights and sounds became even more chaotic. People screaming “OUAIS!!! !” (“yeah” in French), tear gas bombs popping, fireworks and flares going off, the sound of glass breaking, fires burning, your typical riot of civil unrest. The closer I got, the more curious I became. Parisans were breaking off parts of the sidewalks and throwing them on the ground to provide ammo for themselves to throw at the riot gear-clad policemen, who eventually came down the street in droves and droves of what seemed to be at least a dozen police vans. The policemen unloaded from the vehicles, and quickly got in formations, marching into the endless crowds of les gilets jaunes while hitting their night sticks against their riot shields in sync with their footsteps. Thankful to at least be behind the safety of the iron gates of Jardin des Tuileries, it was still a surreal moment. I have been in protests before where police in riot gear were present, but they were not mobile. I felt like I was in a movie. I was running from tear gas that was making my nose and throat itchy and making me cough up mucus. My adrenaline was pumping. I was experiencing something that I thought would never be a reality for me, but merely something I would just see in a clip on the nightly news or my social media feeds. As the protesters continued to run away from the tear gas, the further they came into the Christmas market. Security at the market was then advised by the police to lock the entrance and exit of the market, therefore no one could get in, or out. Including me. Irritated and frustrated, les gilets jaunes, or the yellow vests, began trying to rip down the iron gate to get back out onto the streets to protest the increasing taxes on diesel fuel, and the cost of living within France as a whole. Eventually, they succeeded, but not without casualties. When the gate finally broke free from the hinges, two men on the other side could not gat away in time, and were crushed by the gate. One mans legs were stuck underneath it, while the others entire body was crushed beneath it, and had been knocked unconscious. I thought I had just seen a man die. Once the gate collapsed onto the two men, the protesting and chanting around the area had ceased. Les gilets jaunes immediately called the EMTs and policemen over for urgent medical assistance. While Parisan police have been guilty of unnecessary brutality during these riots, yes, it was still remarkable, and definitely nothing you would ever see take place in events of civil unrest in the United States. Everyone suddenly began to cooperate and put their roles aside to make sure these two men were properly taken care of and receiving medical care as soon as possible. As an American who was aware of the riots before traveling to Paris, I was not aware how disliked Emmanuel Macron was by the general public of France. It was quite interesting to see the French leader portrayed in such a different light, once closer to the truth, than how he has been portrayed in the media in the United States. The riots in Paris are the worst they have seen in decades, and witnessing such history was quite an exciting, even though dangerous, opportunity. If you thought you had to go all the way to Egypt to experience the best that Pyramids have to offer, The Piramide di Caio Cestio has something to say to you. This massive architectural artifact was initially built as a tomb for Gaius Cestius, a magistrate and member of the Septemviri Epulonum. This pyramid is particularly interesting because of it’s status as the only one of it’s kind in all of Europe, and is famous in Rome for being one of the city’s oldest and most well preserved buildings. In spite of it’s age, the Pyramid is surrounded by the roads, train stations, and city vibe of modern day Rome. It is as if everything around the building had changed and grown along with the times except for the building itself which has remained untouched. The scene is almost anachronistic looking. It is so interesting to see a brand new 2018 BMW come rolling down the street and whoosh by the Pyramid, showing little respect for the history, yet showing so much due to the mere fact that these two entities are still able to co-exist with one and other. It is quite a sight to behold and will surely delight history buffs and fans of ancient Roman history. In addition to the tombstones there can be found a large stone cross in the front of the entrance. This is to commemorate the Catholic faith to which many of these fallen Italian soldiers belonged to and likely took solace in as they faced many hardships during the war. At the center of the rows is a stone of remembrance, which serves to honor these soldiers and ensure that their memory lives on. It will be sure to strike a chord with anyone who has been involved in military service or who has had a loved one involved with military service, regardless of what country they served. Prior to last Monday, when I came all the way to the Piramide metro stop for our very last site visit of the class, I had never really visited any of the stops on the Metro B line past the Colosseo stop. As I am sure most people are aware of, Rome is an absolutely massive city as it is home to over 3,000,000 people, so therefore, three months has not been a long enough period of time to explore absolutely every neighborhood in Rome. The piramide metro stop brings you into the neighborhood known as Testaccio, which is across the river from the well known (or at least by college students) neighborhood of Trastevere. Immediately as you step off the metro, you are struck with the presence of a large pyramid (hence the name of the metro stop). The presence of this pyramid was a bit jarring and funny to see, as it is not exactly something you might expect to see in a city like Rome. However, this pyramid has historical significance. The Romans drew inspiration from the Egyptians when creating the obelisks that exist at various piazzas and locations around Rome, and clearly they took inspiration from them yet again when creating this pyramid which strongly resembles the ones in Egypt, although it is much smaller. This pyramid is known as the Pyramid of Cestius as it was built as a tomb for Gaius Cestius, a member of one of the four famous religious corporations of Rome. It is unsurprisingly the only pyramid of its kind in Europe and is one of the best preserved buildings in Rome. This area is also a significant memorial to World War II. Right next to the pyramid, there is a plaque known as the First Special Service Force Memorial, which serves to memorialize the soldiers from the first Special Service Force who died during the war. To add to the remembrance of WWII, the neighborhood is also home to the Rome War Cemetery, which is only around five minutes away from the pyramid. This cemetery houses over 400 graves of commonwealth soldiers from the entire region of Lazio. Many of the graves also include labels of the soldier’s position in the military. There are also several graves dedicated to the unknown soldiers of the war. The quiet and peaceful surrounding of this cemetery also creates a peaceful environment for remembrance. Class tour at Piramide? I had no idea what to expect. I had never been further on line B than the Colosseum. Walking out of the metro station, it looked more like ancient Egypt than modern day Rome. A pyramid in Rome? *What else could this place have in store for me? * The Pyramid of Cestius is the only pyramid of its kind in Europe. While the pyramid, is obviously inspired by the Egyptians, it has a Roman twist by standing on travertine foundation. Standing tall and sticking out from the rest of its environment, The Pyramid of Cestius is definitely a sight to see. In Rome I have seen many statues and historic sites dedicated to war but never one like this. Cimitero Militare di Roma is Rome’s War Cemetery which homes over 400 graves of soldiers. After World War II, Commonwealth War Graves Commission funded the construction of the cemetery. In contrast to the loud and busy streets of Rome, the location of the cemetery provides a peaceful ambiance for those who come to pay their respects. The entrance way is grand. A dome for people to read the history and look through the registry is centered right in the front. Followed by a beautiful, earthy atmosphere surrounding the graves. The garden is very well kept and provides visitors a calming place to reflect on the lives who fought for their country. War memorials honor the souls lost in a times of hardship. As I sat there all I could think about was *is it worth it? * Are the issues that create a war greater than a person’s life. To me no, but that is why I never understood war. Violence never creates peace, only temporary truce. The Cross of Sacrifice, made of pure white stone glistens as the sun shines on it through the trees. The statue stands out as a symbol. These men made a sacrifice for their country, but not only that. They made a sacrifice for their children and their children’s children in hopes that one day there would be no wars to fight and nations would be in infinite harmony. Pyramid of Cestius. St. Paul’s Gate. Rome War Cemetery. It’s 09:37 am and I just stepped off Piramide, a metro stop on Rome’s B Line. The air feels chilly and prickly against my pale cheeks, but not as cold as my home in Tourin. I start walking towards the pyramid. Five minutes later, I’m staring at this breathtaking masterpiece. The Pyramid of Cestius was built as a tomb for Gaius Cestius; Cestius was a magistrate for a religious, Roman corporation– Septemviri Epulonum. As I stand on the sidewalk, my eyes gaze at the marvelous concrete walls. The Pyramid of Cestius makes me feel so tiny and small. Once again, Rome leaves me feeling as though I’m on a cloud. I am just a tiny person looking up at this large, incredible structure. Imagine how the birds feel? They fly over the pyramid and see its large walls from the clouds. I wish I was a bird. Flapping my wings above the pyramid. I could stand here for hours, but the birds chirp and chirp– directing me forward. As I turn left, St. Paul’s Gate greets me with its iron bars. “Stay out!” it yells. During ancient times, St. Paul’s Gate was part of the Aurelian Walls and enclosed Rome’s seven hills. The gate was located in the Ostiense quarter near The Pyramid of Cestius. Originally, St. Paul’s Gate was named Puerta Ostiensis; it was located at the beginning of Via Ostiense, a road connecting Rome to Ostia. As I observe St. Paul’s Gate, I’m swept back to 3rd century Rome. I’m on a journey and I must reach Ostia. How will I make this conquest alone? I look up and meet eyes with the two towers sitting to the left and right of St. Paul’s Gate. This is the way. Father told me St. Paul’s Gate is located at the beginning of Via Ostiense. It’s time to make this journey. I’ve only been walking for five minutes, but it feels like hours. The War Cemetery will be my last stop before heading back to Tourin. As I walk into the cemetery, I see The First Special Service Force Memorial plaque. This plaque honors the brave men who lost their lives during World War II. My heart softens and a tear forms in the corner of my eye. “That could have been my grandfather,” I think to myself. My father, grandfather and great, great grandfather have all given their service to war and battle. I feel as though I can relate to these fallen soldiers. The First Special Service Force was known as The Devil’s Brigade and was an American/Canadian unit. Headquartered in Montana, the Devil’s Brigade deployed to Europe and resided in Italy. My heart softly says a prayer for the family members who battle each day without their loved ones. As I walk into the cemetery, I notice the green, manicured grass beneath my feet. Flowers rest on a few headstones. The Rome War Cemetery is home to over four hundred fallen soldiers. Ordered by the Commonwealth War Graves Commission, the Rome War Cemetery was erected in 1947 after World War II. 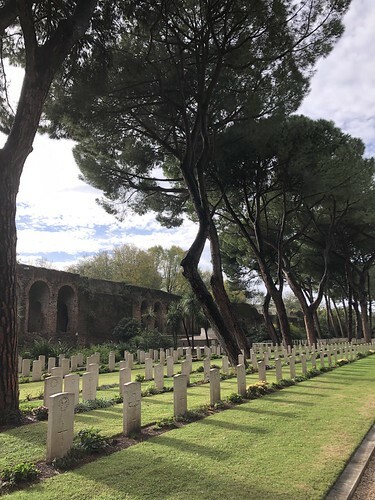 In the beginning, the Rome War Cemetery was for Commonwealth members stationed in Rome; however, as the years passed, the cemetery welcomed members from the entire Lazio region. Each headstone records specific and personal military information for each member. As I weave through the headstones, my humbled heart beats faster and faster. I can hear the cry of each soldier; they miss their families, friends and brothers. “Tell my wife how much I love her,” a soldier whispers in my ear. “Let’s get back out their boys!” a rough, determined voice bellows before me. “I just want to go home,” a somber, melancholy tone echoes in my direction. The fallen soldiers direct me towards The Cross of Sacrifice—a beautiful stone cross that silently rests in the cemetery. Its white, stone detail shines within the cemetery; it is like a tiny slice of heaven. “The Cross of Sacrifice rests in every commonwealth war cemetery. I guess you could say we’re all together in the end,” a man tells me. I softly smile, but my mind is a bit perplexed. I can’t remember seeing him when I walked into the cemetery. Was he at the pyramid? St. Paul’s Gate? His tired, blue eyes remain locked on The Cross of Sacrifice. His aged, wrinkled face smiles at the white stone. “I’ll never forget my brothers. The sacrifice we all made,” he silently utters. I look down at my black boots and the lush, green grass. I go to reply, to say something—to say anything. But when I look up, he’s gone. Like a breath of fresh, cold air, he is gone. My mind returns to reality. I am standing in the Rome War Cemetery. It is 14:55 pm. Have I really been in the cemetery for three hours? My train for Tourin leaves in two hours, but I’m afraid I’ll have to cancel. I must stay here. I must find the man who met me within this cemetery. I must hear his story. When you arrive in a new country, all you want to do is eat out at nice restaurants in order to experience the best foods that this new place has to offer! This was how I felt when I arrived in Rome at the beginning of my three and a half months here. Unfortunately, for the average broke college student living off of the money that they made during their summer job in the months before, this is not a sustainable lifestyle, especially when added with all of the travel expenses that have been adding up throughout the semester from weekly visits to other countries. This article is for anyone struggling to figure out how to eat well on a budget in order to save money for all the other travel needs. When I took my first trip to the grocery store during the first week in Rome, I was pleasantly surprised to find quite cheap prices (relative to the prices that I am used to finding at grocery stores in the United States) almost entirely throughout the whole store. I have found that it is very easy to spend only around 5 euros on the weekdays by saving money through shopping at the grocery stores and making the majority of my own meals at home. So, at the end of the week when I travel or want to go out to dinner with friends, I can allow myself to spend a little more in order to treat myself. It is very easy to buy the ingredients to make your own sandwiches or pasta at home, as all of the ingredients typically cost less than four euros. Italian deli meats such as prosciutto, salami, and speck are typically priced around one to three euros for a regular sized pack, and packs of sliced cheese are usually around the same price. For a nice loaf of bread, you rarely have to spend more than one or two euros. Bags of pasta are typically around 0.80 euros and can make around 6 meals. Breakfast in Italy is certainly much smaller than it typically is in America, and typically consists of a café (espresso) or cappuccino with a cornetto (croissant), and costs around 2 euros. Grocery stores also sell boxes of cereal for around 2 euros. For those who are in a rush on most mornings, they also sell bottles of yogurt smoothies for approximately 0.80 euros per bottle. For times when I do not have time in the morning to prepare a lunch at home to take to school, I usually head to a nearby pizza shop, bar (which is kind of equivalent to a small café that sells a variety of different food items), or alimentari (where you can buy your own ingredients to make a sandwich or have them make it for you) to get a sandwich, slice of pizza, or arancino rice ball for lunch. These all only cost around 2.50 euros. Rather than selling pizza slices pre-cut like most pizza places in America, most Italian pizzerias ask you how much you want, point to an estimate with scissors on the long thin flat bread pizza and cut a square or rectangular shaped piece and then cut that piece into quarter squares. Prices are based on weight, so after they cut off your piece they weigh it on their scale to determine the price of your piece. A cheap option for lunch is a slice of pizza! Going out to eat is always pricier, however, many restaurants offer aperitivo which is similar to happy hour, and typically costs around 10 euros per person for a drink and an open buffet or a variety of several different appetizer dishes which often includes bruschette and a platter of a mixed variety of sliced meats and cheese. These kinds of restaurants are easily accessible and incredibly easy to find. An easy way to avoid overpriced food in Rome is to steer away from the more touristy spots – any restaurant with a view of a piazza or monument will be very expensive simply because of the view you are getting by eating there, not even necessarily charging you for the quality of the food you are getting. Some of the best restaurants in Rome are in smaller, more hidden areas that are popular to the locals.